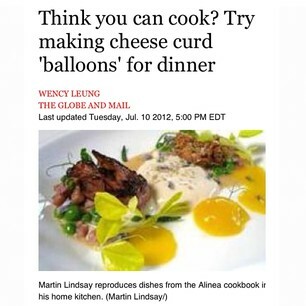 Alineaphile was featured today in Canada’s national newspaper, The Globe and Mail. Read it! Until recently, Joey Scott rarely cooked anything more complicated than instant ramen noodles (if you can consider that cooking). But for the past three months, armed with a copy of the Alinea cookbook, an exquisite publication that’s as much about artistry as it is about culinary technique, the Chicago law student and gastronomic greenhorn has been tackling avant-garde dishes that would scare off experienced cooks. In his tiny home kitchen, he has juiced bundles of fresh spinach, arugula and romaine, creating a frozen salad, topped with a slush of red wine vinaigrette that fit in the palm of his hand. He’s steeped a crushed cigar in cream, then mixed it with gelatin to produce delicate, tobacco-flavoured bites, finished with fresh blackberries, long peppercorns, and a sprinkling of smoked Maldon salt. He’s also made “caramel popcorn, liquified,” by simmering freshly popped popcorn with water, butter, sugar and salt, then straining the broth to serve with a caramel froth. “It’s a hobby,” says Mr. Scott, who’s documenting his creations on his blog Alinea Newb. “It’s a good distraction, especially during the semester when I just want to find something to do besides study. Say hello to the hard-core culinary hobbyist. The number of labour-intensive, fine-dining cookbooks has proliferated in recent years, giving rise to a small but dedicated following of ultra-ambitious home cooks around the globe, who devour nitty-gritty technical details and relish the challenge of recreating Michelin-star meals. Using cookbooks from top restaurants, such as, Noma: Time and Place in Nordic Cuisine, Eleven Madison Park: The Cookbook and Mugaritz: A Natural Science of Cooking, they’re creating dishes that take countless hours – and sometimes even days – of preparation, obscure ingredients and expensive equipment. Their complex creations make Julie Powell’s challenge, of Julie & Julia fame, look like child’s play. Mr. Nassar, who posts the results of his efforts on his blog Oven-Dried Tomatoes, developed a love of food at a young age, growing up in Lebanon and watching his grandmother make everything from scratch. Experimenting with ever-more elaborate recipes and techniques is his way of learning, he says, noting it “kills” him when people regard high-end cookbooks as mere coffee table decoration. “So much work and so much testing and care went into [books] like this that it’s a shame not to use it and learn from it,” he says. His attention to detail is apparent in his photos of artfully plated compositions, such as the stunning, home-made carbonated Mojito spheres he created using a reverse spherification technique. When you’re working with rare and luxurious ingredients, it’s probably wise not to wing it. Martin Lindsay of San Diego says he once spent $200 (U.S.) on matsutake mushrooms from Oregon to reproduce a dish from Alinea. “You know, you’re holding a bowl of $200 worth of mushrooms in your hand, thinking, ‘Hm. What am I doing? I’d better not screw up,” says Mr. Lindsay, a graphic designer who is working his way through the recipes in the book and blogs about his progress on his site, Alineaphile. He recently reached the halfway point after close to four years and celebrated the milestone by – you guessed it – treating himself to a dinner at Alinea. Mr. Lindsay has literally gone to great lengths for his challenge. He once ordered Japanese junsai, the tiny branches and bulbs of an aquatic plant, from a spice shop in Paris. And when he failed to get his hands on cheese curds for Alinea’s version of a caprese salad, he learned to make them from scratch. As it turned out, that was the easy part. He then had to warm the curds and blow them into balloons, which he filled with tomato water foam, using a pressurized canister. Yes, he admits, the hobby can be expensive. And yes, some recipes simply don’t turn out. But cooking offers him an outlet, after sitting in front of a computer all day. “It’s always just something I’ve enjoyed. It’s a very cathartic experience, cooking,” he says. Mr. Lindsay anticipates it’ll take him another year and a half to finish his challenge. After that, he says he’ll likely try to tackle another demanding cookbook. Just recently, he visited an online forum, where someone had mentioned how crazy it would be to execute all 5,000-plus recipes in Escoffier: Le Guide Culinaire, regarded as the bible of French cuisine. It was a pleasure to reading your blog . I am a chef as well. Really appreciated that you have done so amazing job to re-cook all the dishes again.